This beautiful illustration depicts the noisy and crowded streets of London. This would probably have been a real street or area well known for hawkers and barrow sellers where people could have purchased potatoes, ice cream, fruit, vegetables, beer, medicines, cheap jewellery, clothing and all manner of goods. 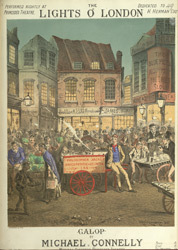 The illustration depicts London as a busy and noisy city with hawkers shouting their wares to customers, horses and carts trundling past and the general hustle and bustle of daily life. The Princess's Theatre was one of Queen Victoria's favourite theatres and this piece of music, like many popular ballads, was taken from a production performed there.